We regret to have to report the death yesterday of Life Member Geoff Breakell at the age of 82 after suffering a heart attack. A director of the family lift manufacturing business in Blackburn, Geoff began his racing career in the late ‘50s with a Lotus Eleven which was followed by a 1500 cc Lotus Fifteen, both powered by a Coventry- Climax engine. Geoff enjoyed increasing success with these cars, principally on the Northern circuits, and also at Silverstone where he finished third in the 1500 cc sports car race at the Daily Express International Trophy meeting in May 1960 behind the Lola-Climax Mk 1s of Peter Ashdown and Alan Rees. For the following two years, Geoff switched to single-seaters, acquiring a Formula Junior Lotus 20 with which he was one of the front-runners at national level, again principally in the North of England. He won the Easter Cup at the Rufforth airfield circuit in 1962, having finished second there to Peter Procter at the end of the previous season. Travelling further afield, also in 1962 Geoff finished third at the Goodwood Whitsun meeting and was similarly placed at Oulton Park in July. Staying with Lotus, Geoff switched back to sports-racing cars for 1963, acquiring a Lotus 23B part way through the year, with which he continued into 1964. Probably his best result was third place behind Jim Clark’s Lotus-Climax 19 and the AC Cobra of Jack Sears at the Oulton Park Spring Cup while he was fourth in the sports car race at the last race meeting to be held on the Aintree Grand Prix circuit in May. For 1966, Geoff acquired the ex-Team Elite/Sid Taylor Racing Brabham-Climax BT8 with which Denny Hulme had enjoyed considerable success including victory in the RAC Tourist Trophy at Oulton Park. Geoff carried on the good work by finishing fourth in the same race a year later, Denny the winner once more but now in a Lola-Chevrolet T70 Spider. Later in the year Geoff brought the BT8 home third at Castle Combe. 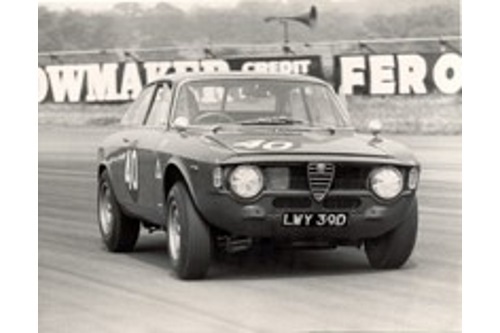 A trip up to Ingliston at the beginning of 1967 produced victory in the sports car race ahead of Richard Scott’s Elva-BMW Mk 7S but the Brabham was then put to one side as Geoff drove Tom Clapham’s Alfa Romeo Giulia Sprint GTA in the British Saloon Car Championship. It was with this car that Geoff had two of his rare races outside the UK, competing in the Zandvoort round of the European Touring Car Championship and the Nurburgring 500 ks, finishing 8th in the former but being forced to retire at the ‘Ring. Through 1968 and 1969 Geoff raced a Chevron-BMW B8, finishing third in the Lombank Trophy Special GT race at Ingliston, behind John Miles’s Gold Leaf Team Lotus Type 47 and the Chevron-FVA B8 of Johnnie Blades, and second at Snetterton to Barrie Smith’s B8. Geoff than retired from circuit racing until 1991 when he contested the second season of the Mazda MX5 UK Cup. However, his passion for motor sport never left him and he spent many years competing very successfully both in historic rallies with an Alfa Romeo Giulia Ti with occasional forays into the Monte Carlo Rally, the RAC Rally and the Pirelli Classic Marathon. Since 2000 Geoff’s son James has been a very active competitor initially with the Giulia Ti and subsequently with a Radical sports car. Geoff was a quietly very proud BRDC Member who took a keen interest in Club matters, attending many Club gatherings and participating in track days. To his wife Margaret, his son James and daughters Joanne and Rachel the BRDC extends its most sincere condolences. Geoff’s funeral will be at Whalley Parish Church, Clitheroe BB7 9SY on Thursday 19 April at 12 noon all Members are welcome.